This pair of maps of indigenous cities—one the capital of the Aztec empire, the other of the Inka—graced a luxury city atlas published in Europe. Both maps show the imperial cities as imagined by European viewers, not as they actually looked in the late 16th century. The printed page was the primary vehicle for information about the Americas to circulate in Europe, but because the Spanish crown protected information about its possessions, such publications were often fanciful or out of date. Franz Hogenberg, the European artist who created these views, never saw either Mexico City, formerly Tenochtitlan, or Cuzco with his own eyes. Instead, he worked from others’ images and descriptions of the two cities. He identified each city, and its location (New Spain, Peru) with the legends written in Latin and set into scrollwork frames. 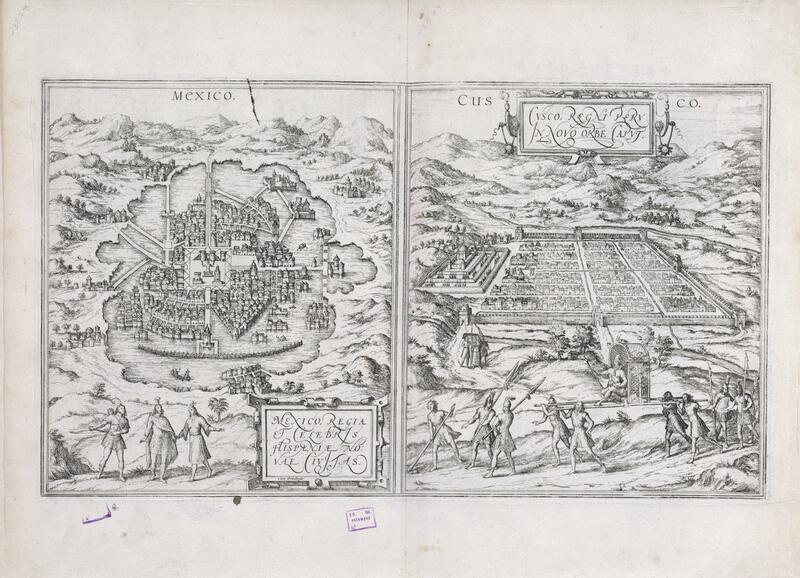 The map of Mexico City (once known as Tenochtitlan), on the left of the two-page spread was derived from a European map published in 1524 to accompany the letters of Hernán Cortés. The 1524 map is also included in Vistas. The version here, however, is reversed. At the center of the city, the large open square represents the sacred precinct of the Aztec capital. The turreted towers, the double pyramids of the Templo Mayor, and the pedestal with an idol at the center of the image were all inspired by written texts and earlier images of the pre-Hispanic city that circulated in books and prints in Europe. On the right is a map of Cuzco. No drawn Inka maps of the Cuzco reached Europe, so representations of the city were drawn from written descriptions. The massive stone fortress of Saqsawamán is shown as a series of concentric walls to the left of the city with a central structure resembling Hagia Sophia, the famous 6th century cathedral, and later mosque, in Istanbul. In the foreground, the Inka emperor is shown being carried in a palanquin. By the time this image was printed, the last Inka emperor, Túpac Amaru, had been executed by Spanish forces. A colored version of this map can be found in Vistas. Many editions of this work are known. The stamp of its current owner, the Biblioteca Nacional of Madrid, is seen in the bottom margin. The atlas may have been the brainchild of the engraver Franz Hogenberg (1535-1590), who was born in Belgium but eventually settled in Cologne. Here he met Georg Braun (1541-1622), a geographer who would serve as editor of the six-volume atlas. They compiled city views with accounts from other published sources and their wide-spread correspondents. Hogenberg was joined by other artist-engravers to make the plates. As with many 16th century atlases, buyers could choose the maps they wanted to be included, meaning that each set of atlases is slightly different. These maps were made by an engraving process. The image was scratched onto a smooth copper plate and resulting grooves held the ink that was picked up by the paper. The plates from this work were reused for almost two centuries. These particular maps are two of the hundreds of city views bound together to create Civitates orbis terrarum, a multi-volume atlas that described the world’s cities. Deluxe editions of the maps were sometimes hand-colored, but these are not. 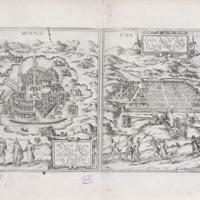 The first volume of the Civitates orbis terrarum, which contains these two maps, was published in Cologne (in present-day Germany) in 1572. In this atlas, Cuzco and Tenochtitlan appeared with depictions of European and North African cities—Brussels, Bruges, Genova, and London, as well as Mombassa, Safi, and Cairo. A full set of Civitates volumes would have been a luxury item, yet many of single sheet engravings were popular and circulated widely. As part of their commercial enterprise, the publishers sold many scenes individually to travelers, merchants, and others eager to know about places they might never visit or see. This map pair allows reveals one way Europeans experienced the New World, through images on the page, widely circulated because of print technology. The message of these maps is ambiguous. On one hand, their half-clothed occupants seem foreign and exotic, while the presence of organized cities connotes the height of civility. These images of Cuzco and Tenochtitlan also remind us, as modern viewers, of the romantic appeal and interest American cities held in 16th and 17th-century Europe. And while inspired by European interests in cartography and travel, the Civitates was also bound to colonial and commercial expansion. These city views thus testify to a common European response to pre-Columbian America: a willingness to cast its image in terms familiar to European viewers, and in so doing, remake the pre-Hispanic past into something it never was—except in Europe’s imagination.